So you're training for a 5k (or 10k or marathon or whatever) and you have a training plan. You know your heart rate, your training zones, and your mile pace. But none of it will do you any good if you are low in iron. Say what? Being low in iron can negate all the hard training you do? That’s right, it can. In fact, the iron content in your body’s tissues is one of the main factors that determines your aerobic capacity, which of course, greatly affects athletic performance. The body uses iron to produce oxygen transporters – such as hemoglobin and myoglobin – and to produce energy by serving as a cofactor to many energy-using enzymes. Strenuous training increases the physiological demand for oxygen which then increases the demand on the transport systems as well. Hemoglobin then carries oxygen from the lungs to all bodily tissues and myoglobin in the muscle stores oxygen for use during exercise. Iron deficiency anemia (IDA) is more common in athletes than sedentary individuals and in female athletes than male athletes. Some studies suggest 20 – 50% of female athletes and 4-50% of male athletes have low iron stores (which is not IDA but can lead to IDA). Higher prevalence of low iron stores and IDA are seen in runners, swimmers, triathletes, rowers, and soccer players. Chronic fatigue is the most common symptom for iron depletion but it’s also a symptom of other conditions (and a common side effect of hard training!) so be careful in diagnosing yourself with iron depletion! A diagnosis of IDA or iron depletion Is made with a blood test and should be done at least 24 hours post-training or during a recovery period. You will need a complete blood count (CBC), serum ferritin, serum iron, transferrin saturation, and total iron binding capacity (TIBC). Discuss your results with a physician and a Registered Dietitian (like me!). 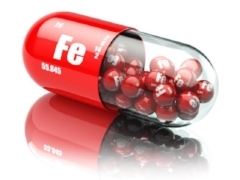 You can prevent iron depletion and IDA by consuming adequate iron through food intake or by taking iron supplements. Iron in food occurs in two different forms: heme and nonheme iron. Heme iron is absorbed much more efficiently than nonheme iron. Oysters and beef are high in heme iron; grains, leafy greens, and lentils are high in nonheme iron. Vegetarians and vegans are at a higher risk for iron depletion but if they include iron-rich foods and/or take an iron supplement, they can easily maintain adequate iron stores. How much do you need each day? The Dietary Reference intake (DRIs) for iron are 8 mg/day for males aged 18 – 50 and 18 mg/day for females 18 – 50. For both men and women over 50, the DRI is 8 mg/day. You do NOT need to spend a lot of money on iron supplements! Do not take iron supplements and antacids or calcium supplements at the same time. It is best to space doses of these 2 products 1 to 2 hours apart, to get the full benefit from each medicine or dietary supplement. Do not take iron supplements with coffee or tea as the tannins in these beverages reduce the absorption of iron. DO take iron with vitamin C-containing foods, such as orange juice, or with a vitamin C supplement. Vitamin C enhances the absorption of iron. Or simply take iron before bed on an empty stomach to maximize absorption. If you think you might be low in iron, get a blood test and see your physician. Otherwise, be sure to include lots of iron-rich foods in your diet and/or take an iron supplement.